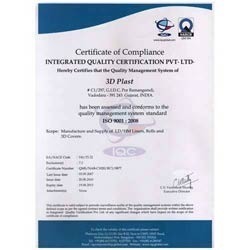 "3d PLAST" is an ISO 9001 : 2008 certified company, and commenced in the year 2006 at Vadodara, Gujarat, India. We are one of the leading Exporter, Supplier, Manufacturer, Importer and Trader of Packaging Rolls and Bags such as Plastic Coated Wooden Blocks, Shrink Film, Packaging Cover and Many more. Our packaging products include LDPE Roll, Gusset Roll, PVC Shrink Bag, LD Bags, HM Bag, LDPE Film, LDPE Shrink Film, HM Film, PVC Shrink Films, Heat Lamination Film, Pallet Cover, Plastic Shrouds, Plastic Bags, Plastic Rolls, PVC Heat Shrink Sleeve, Plastic Sheets and Custom made Packaging Products. These products are manufactured in our advanced manufacturing unit that is equipped with sophisticated machinery. With our dedication to quality and client satisfaction over the years, we have been able to sustain our leading position in this competitive domain. We have a team of experts who constantly conduct tests on various parameters to provide efficiency and durability. We are also exporting of our products across the globe. We have been functioning under the esteemed guidance of "Mr. Jagdish Shah", who, with their vast domain expertise and brilliant leadership skills, have led the organization to attain heights that were unimagined earlier. Owing to our ethical disposition, we are considered extremely trustworthy by the customers. Manufacturer, Trader, Importer and Exporter of LDPE and HM/HDPE Rolls and Bags for Packaging. Certification Type: ISO 9001:2008 company. Assisted by a team of diligent professionals, we are able to be at par with our competitors in this domain. These professionals are highly experienced and have in-depth process knowledge of their respective field. Moreover, all our team members work in close co-ordination with each other to ensure smooth production process. Their meticulous efforts help us in meeting the bulk consignments of our esteemed clients within the stipulated time frame. Besides, these professionals remain in close proximity with the clients in order to meet the specific demands of the clients based across the globe.